MultiSurveys is yet another malicious program that we have classified as adware. This program’s only job is to show you commercial advertisements, so you will not benefit from having it installed on your PC. Therefore, we recommend that you remove it as soon as you can. We would also like to add that it is a potential security threat to your system since it can promote malicious software. In addition, it can gather information about you and use it for commercial purposes. So, all in all, this application is of no use whatsoever, and yet, many people seem to have it on their computers. So let us begin our analysis with this program’s distribution methods. Our research has shown that MultiSurveys is similar to Own Dates, BabyMegs, BeautyMost, and a few other programs. And, just like the aforementioned similar programs, MultiSurveys’s developer is unknown. Therefore, based on the functionality of all of these programs, we conclude that they come from the same developer. Also, our conclusion is supported by the fact that the promotional websites of all of these programs are currently inaccessible, which brings us to another important point of how this program is distributed. This adware’s homepage is Multisurveys.com, and it used to host its InstallCore-based downloader which also promoted other malware. However, even though this website is down, users still somehow get this infection. Therefore, we can only assume that it comes bundled with malicious software bundles that are featured on websites that distribute pirated software or other illicit content. Thus, we believe that users get this program accidentally as it may be hidden deep in the bundle and you have to select custom installation settings to uncheck its installation. However, it may also be installed automatically without your consent, and if that is the case, then you can uninstall without hesitation. However, if this program were to remain on your computer, then you will start to have problems with it right from the get-go. MultiSurveys is very annoying since it one of the two ways it can display advertisements includes generating a dedicated Graphical User Interface (GUI) window that loads its promoted websites, which in this case is mostly Multisurveys.com/redir.php which redirects to Savings-galleria.com, a site that contains deals and offers of unverified legitimacy. This site redirects to other websites, such as Mindspay.com and Regflow.com. It can also show advertisements by launching Internet Explorer and loading various promotional websites. However, we are of the opinion that not all of the promoted websites are legitimate. Some of them might be used for scamming purposes or getting your computer infected with malware such as spyware, keyloggers, and worst of all — ransomware. Hence, this program can cause serious security-related problems, and this is the main reason you ought to uninstall it. Nevertheless, the problems do not end there. We have found that this application is capable of gathering information about you which is an intrusion of your privacy. We want to clarify that it can automatically collect information of non-personal nature which includes, your Internet Protocol (IP) address, Internet Service Provider (ISP,) device type, browser type, geographical location, and so on. This information is primarily used for customizing the promotional campaign and tailoring the ads for unique users to make more money because, make no mistake, this program’s only purpose is to make money for its developers. It is evident that this program’s developers have no regard for your computer’s security, so they are happy to promote malicious content to make even more money. 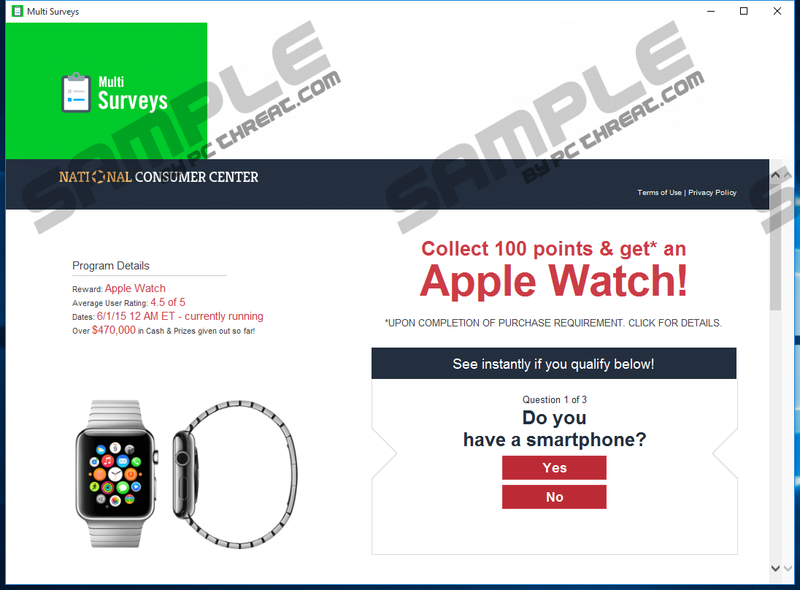 To sum up, MultiSurveys is an ad-supported program whose only purpose is to render annoying commercial advertisements that come in the form of a GUI window or an Internet Explorer window. The ads are not only irritating, but unreliable as well, and we think that this program may be used as a platform for promoting malware that is ten times as malicious as this measly adware. Also, this low-grade application is set to gather information about you to be used for customizing the advertising campaign and thus advancing its developer’s agenda. This program does not hold up to scrutiny, and so it is clearly malicious, so do not hesitate to remove it. Locate the adware in the program list. Locate the program and click the Uninstall button. Press Windows Key and click Control Panel. Locate the malicious software right-click on it and click Uninstall. Locate the application program and click Remove. Quick & tested solution for MultiSurveys removal.